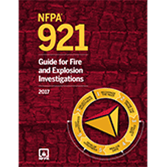 NFPA 921 sets the bar for scientific-based investigation and analysis of fire and explosion incidents. Referenced in the field, in training, and in court, it is the foremost guide for rendering accurate opinions as to incident origin, cause, responsibility, and prevention. It is intended for use by both public sector employees who are responsible for fire investigation and private sector professionals who conduct investigations for insurance companies or litigation purposes.